-Shell material: 304 stainless steel cover and polycarbonate lens. -Radiation Angle: 112.5 degrees. Base: 2.36". 1.It can improve the safety index when you rowing.Especially at night. 2.Equipped with stainless steel cover and polycarbonate lenses. 3.Resistant to corrosion and the most extreme Saline environment. 4.Easy to install.Safe and reliable. 1.Senzeal is the only one sold Senzeal products seller. 2.Color may be a little different due to monitor and light brightness from pictures.Thank you for your understands. 3.Please allow a little size error due to hand measure. 4.We will provide best customer service for every customer,if you have any question please feel free to contact with me. We will try our best to solve your any problem. Made of silver stainless steel cover. The port side is red and the starboard side is green. 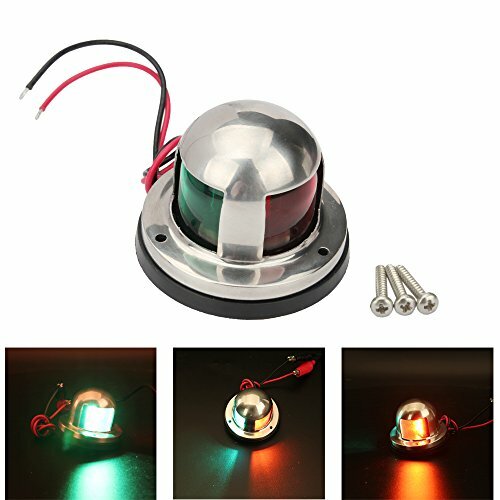 High power 8 LED per bulb, long lasting life, low power consumption. Easy to stall with predrilled holes. It can improve the safety when boating. Especially at night. Works well on touring car & boat, yachts, pontoon, fishing boat, speed boat and other boats. Use for bow, stern, or running lights.